This polar white sedan has an automatic transmission and is powered by a 147HP 2.0L 4 Cylinder Engine. 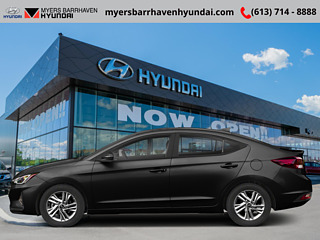 Our Elantra's trim level is Preferred AT. 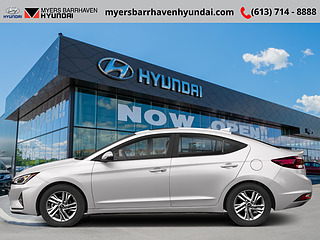 Upgrade to the Preferred trim of the Elantra and get treated to a host of features including heated side mirrors, a 6 speaker stereo with a 7 inch touch screen, Android and Apple smartphone connectivity, Bluetooth, heated front bucket seats, a heated steering wheel, cruise control, remote keyless entry, air conditioning, front and rear cup holders, power door locks, blind spot detection, lane change assist, rear collision warning, a rear view camera and much more. This vehicle has been upgraded with the following features: Heated Seats, Heated Steering Wheel, Android Auto, Apple Carplay, Rear View Camera, Bluetooth, Air Conditioning. This is a demonstrator vehicle driven by a member of our staff, so we can offer a great deal on it. Buy this vehicle now for the lowest weekly payment of $78.68 with $0 down for 96 months @ 4.03% APR O.A.C. ( Plus applicable taxes - & fees ). Incentives expire 2019-04-30. See dealer for details.